You say you’ve never heard of a “separatist fundamentalist” Wesleyan Holiness church? I’m not surprised – such a church is practically unheard of nowadays. Yet I would say 99% of Wesleyan Holiness churches were separatist and fundamentalist prior to 1942 (when the National Association of Evangelicals was formed, popularizing heretical New Evangelicalism). Note – I’m defining “fundamentalist” in this blog as adhering to the Fundamentals, a series of articles between 1910-1915. Even as late at 1970 or so, Wesleyan Holiness churches still exhibited separatist and fundamentalist traits. Specifically, they still had regular altar calls, used the King James Version exclusively, and sang hymns exclusively (no guitars, drums, etc.). Biblically sound churches need biblically sound pastors. Such men of God are increasingly rare in these End Times. How do we find true men of God? What should we ask prospective pastors? I am developing a list of questions for a prospective pastor, for a hypothetical separatist fundamentalist Wesleyan Holiness church. (These are the things I personally would look for in a pastor coming to my church.) Many of these questions are adapted from a list by Manny Silva. Click here for his original list, entitled “Questions For a Prospective Pastor.” Manny Silva’s questions are marked with the notation “(MS)”. 1. A simple Yes or No answer: Are you a born again Christian? If yes, can you give a specific date when you had a “crisis conversion experience”, when you repented of your sins and accepted Christ as your Saviour? Please share your testimony – when, where and how you accepted Christ. Also, please explain your concept of salvation. Does your concept of salvation line up with John Chapter 3? And do you believe Jesus is the only way to Heaven? 2. What is your educational background for the ministry? Were the schools you attended biblically sound? If not, why did you attend these? 3. Have you pastored, led youth, etc. elsewhere. If so, where? 4. Are you Spirit filled? We are not referring to “Spirit baptized” here. We are looking for a pastor who is mature in Christ, 100% committed to the Lord, walking in obedience to His Word, and showing all the “fruit of the Spirit” (Gal. 5:22-23). We do believe the Holy Spirit can work today miraculously. However, the supernatural manifestation gifts have been so greatly abused, that we strongly frown on the practice of these gifts in a local church. Paul himself alluded to preaching, teaching, etc. as being more important than the gifts of tongues, etc. 5. Wesleyan Holiness – Do you follow the teachings of the “separatist fundamentalist” Holiness movement (as taught in the late 1800’s to early 1900’s)? 7. Fundamentalist – Do you adhere to the series of articles entitled “The Fundamentals” (1910-1915)? This would include 1) being “militantly” opposed to false teachers, and 2) being willing to separate oneself and one’s congregation from false teachers. 8. Evangelical – Do you consider yourself evangelical? If so, do you consider yourself Classic Evangelical, New Evangelical, or Neo-Evangelical? Please define each of these three terms. 9. What is your eschatology? Do you believe the End Times/the Tribulation is coming soon? And do you believe Christ is coming soon (either before, during or after the Tribulation)? Or do you have an Emerging/Emergent eschatology? 10. What is your philosophy of church leadership? Do you believe in taking total control? Or are you submissive to elders, deacons, and/or voting by members? 12. If you pastored a church previously, did your church have a doctrinal statement? If so, did your church really believe and follow its doctrinal statement? Or was it just empty words? Were there any mismatches between the church’s doctrinal statement and what you preached? 13. (MS) A simple Yes or No: Do you believe the Bible is the inerrant, infallible Word of God in everything it teaches? 14. (MS) If you answered No to question 1, who and by what authority determines which parts are in error? Please give some examples of those errors. 15. (MS) Again, if you answered No, explain how anyone can have confidence in the Bible if you claim that some parts of the Bible are in error. 16. Do you exclusively use the King James Bible? If not, why not? We are looking for a pastor that uses the KJB exclusively in the English, yet is not Ruckmanite (click here for more info from David Cloud). This pastor should hold to the Textus Receptus-KJB (TR-KJB) position, as explained here by Bro. Cloud. 17. How evangelistic are you? Do you regularly preach salvation messages (what we call “The Blood and The Cross”)? Do you have regular altar calls? Do you send out church members to witness door to door, pass out tracts, etc.? 18. Do you have a passion for missions? Please explain your philosophy of missions. Do you feel the main goal of missionaries to help fulfil the Great Commission? Or do you believe in more of a charitable “social gospel” type of mission work? 19. (MS) Do you believe in evolution? If you do, why does the Bible describe creation as the historical way we were created? How do you explain the New Testament references to Adam by Jesus and the apostles? 20. (MS) If you believe in evolution, does that mean that you believe that Adam and Eve were not real, since you believe we were created through evolution? What about Romans 5:12, and other similar references in the Bible? 22. (MS) If yes, how does that make us confident in the Biblical prophesies, if we state that God may not know the future? 23. (MS) How does the Bible teach us to pray? 24. (MS) Do you believe that lectio divina is biblical? If so, please give solid scriptural reference that supports it. 25. (MS) Is God capable of making mistakes? 26. (MS) Whether you are familiar with Brian McLaren’s writings or not, do you consider him a Christian, if he denies the substitutionary atonement of the cross, and has stated that people can find Jesus and stay within their own faith? 27. Do you oppose abortion in all cases? If not, in what cases do you believe abortion is permissible? 28. (MS) Do you agree with Tony Jones’ statement that unrepentent homosexuals can still be Christians? 29. (MS) Do you agree with Rob Bell’s teaching that when Peter sank in the water, he really lost faith in himself, and not in Jesus? 30. (MS) Do you believe in sanctioning official ecumenical gatherings and functions with a Roman Catholic Church? 31. (MS) If Yes, is it okay then to also fellowship with Jehovah’s Witnesses and Mormons in their churches? If not okay, what’s the difference and why? 32. (MS) Prayer labyrinths are very popular now in evangelical universities and churches. What is your position on labyrinths and whether they are biblically sound? And would you ever consider using one in our church? 33. (MS) Is the use of prayer beads or prayer ropes biblical? If not, what is your thought on the fact that Barefoot Ministries [a Nazarene publisher] sells a book that promotes the use of prayer ropes (praying the rosary, in other words). 34. (MS) Do you believe that the Bible is the SOLE authority for Christian faith and practice? 35. (MS) Do you believe pastors should always encourage their congregation to be Bereans, in other words, don’t automatically take their word for it, but search and verify the scriptures, as Paul commended the Bereans? 2) Prospective Pastoral Candidate Questionnaire, University Baptist Church (seeking a fundamentalist pastor). Why did God create so many stars? 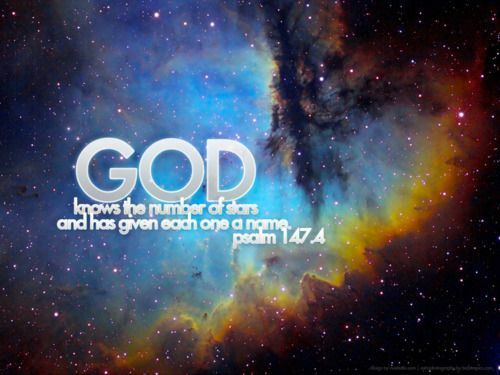 I have taken up stargazing recently, and am becoming very interested in Creation Astronomy (the biblically sound Young Earth Creation view which states that God created the Sun, Moon and stars on the fourth literal 24-hour day, about 6,000 years ago). One of the questions that has occurred to me: what is the purpose of the stars? More specifically, why did God create so many stars? Of course I should ask, who are we to question God’s actions and decisions? But as created beings with intelligence and an inquisitive mind, the question does occur to us. The above verse forms the basis of what Jay describes as Classical Astronomy. In this article he explains Classical Astronomy in more detail, and points out the faults in modern day secular astronomy. At some point we have to sit back and say “my Lord and my God” and “we… just… don’t… know…” 99% of the answers. This one thing I know, our God is a truly awesome God. In the end we must admit, His creation of the Universe is truly beyond our comprehension.